The numbers are out, and things are looking very good for La Sagrada Familia. Antoni Gaudi’s magnificent masterpiece and perhaps the most recognizable church in the world took the top spot in the Barcelona Tourism Board’s 2014 report on the top-10 Barcelona tourist attractions. We couldn’t reach Gaudi for comment — it’s hard to get solid quotes from a dead guy. Here are the top-ten most visited sites in Barcelona. The numbers in parenthesis represents the increase or decrease in visitors compared to 2013. This is no surprise, as the church Gaudí built has long been Barcelona’s most popular tourist attraction. And who can argue that it doesn’t deserve to be at the top? Only the most bitter skeptics could complain about the majestic heights of the Catalan temple. If you weren’t certain of Gaudí’s importance to the Catalan people or the city of Barcelona, surely you must be convinced now. 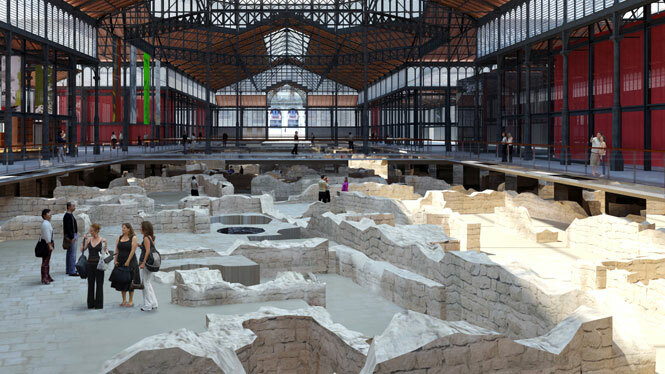 The visionary architect is responsible for more than 7.6 million visits to Barcelona’s top-10 sites. In fact, between La Sagrada Familia, Park Güell, La Pedrera and Casa Batlló, Gaudi accounts nearly as many site visits than the the six other sites on the top-10 list combined. Park Güell takes the second spot on the top-10 list of Barcelona tourist attractions. The quirky park was free until 2012, at which point the park started charging admission. According to figures released by the Barcelona Tourism Board, approximately 9 million people visited Park Güell in 2012, the last year of free admission. This site is a surprise top-five finisher because in 2013, the Born CC only had about 675,000 visitors. The site is home to artifacts of daily life from the lat 17th century and the early 18th century, right around the time Catalonia was fighting for its independence. The artifacts were discovered when excavators were preparing to build a neighborhood market. With the ruins popping around every corner, the market plan was scrapped and the facility was turned into what is now the city’s third most popular tourist attraction. The numbers here are misleading, though, because entrance into the museum is free if you just want to look at the ruins from above. Every other attraction on the list requires an admission fee of at least 7€, with many attractions costing more than 15€. The Barcelona Aquarium is one of four sites on the list (zoo, Poble Espanyol, La Pedrera) to see a dip in visits this past year. Though it’s still the fourth most-visited site among Barcelona tourist attractions, we don’t think it should be rated that high. The aquarium is small, boring and can’t really compete with aquariums in American cities with similar populations to Barcelona. Our advice: steer clear of the Aquarium and head to the fifth-most visited site in Barcelona. Few people don’t enjoy a visit to the FC Barcelona Museum, housed in Camp Nou, the holy ground at which legendary soccer club FC Barcelona plays its matches. FCB’s ubiquitous fame means many visitors travel Barcelona with the specific goal of visiting the museum to pay homage to the team they love. That more than 1.5 million people visit the stadium every year to see the museum is a testament to the passion of the FCB fan base, as well as the storied heritage of soccer in Catalonia. In the words of the club’s motto, FC Barcelona is more than a club. Poble Espanyol is a architectural representation of the different regions and styles of Spanish life. Poble Espanyol also offers all sorts of restaurants and bars, and it also has a pretty robust night life.We wouldn’t say Poble Espanyol is a 100% authentic Spanish experience, but as a tourist experience it can be pretty fun. Plus, it’s right around the corner from the MNAC and the Magic Fountain. Barcelona’s Zoo is located at the east end of Parc de La Ciutadella. In our opinion, the zoo is a much better way to spend your money than the aquarium. Some of the highlights of at the BZ are its tigers, it’s Iberian wolf and the zoo’s beloved dolphin show. The MUHBA is another surprising tourist attraction on this list because between 2013 and 2014 visits nearly doubled! The city history museum near Plaza del Rei in the Old City is one of our favorite museums in the city because you can go beneath the ground and view the remnants of a Roman village that used to be at the center of Barcelona life back when the city was called Barcino. La Pedrera is one of Guadi’s two masterpieces located on Barcelona’s swanky Passeig de Gracia. Known as Casa Mila because of the patron who originally commissioned the work, La Pedrera may very well be the world’s most famous apartment building. It’s days of housing tenants are long gone (only one remains), but it’s doors have long been open to the public. This past year’s drop in visits may be due to renovations which took place on the outside of the building. Gaudí’s La Pedera and Gaudí’s Casa Batlló. Each one of the 10 Barcelona tourist attractions you read about on this list reflect an aspect of Barcelona and Spanish culture. Casa Batlló is another one of Gaudi’s residential projects, but unlike the La Pedrera (built from the ground up), Battló was a renovation of an existing building. That doesn’t take away from the brilliance of the structure, though. Gaudi’s creativity is on full display at this attraction. His artistry is evident in nearly every corner of the building, beginning with the whimsical facade. Part of why we do what we do at Barcelona Experience is because we love and embrace the nuances of Barcelona’s mosaic of cultures and philosophies. Check out our Barcelona tours page to find out how we can work together to create an itinerary which includes your favorites on this list! If it’s a bike tour you’re looking for, visit our recently updated Barcelona bike tours page!